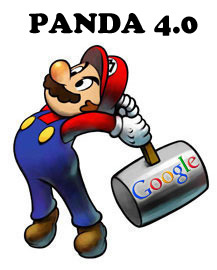 Home > Google News > Google Updates > Google Panda 4.0 Update? A Diversification Update. Google Panda 4.0 Update? A Diversification Update. There is some serious uptick in webmaster and SEO chatter in the WebmasterWorld forums as of this morning in regards to a possible major Panda update. Major enough, we might upgrade the name from 3.9.X to a 4.0 release. Just fyi, we rolled out a small algo change this week that improves the diversity of search results in terms of different domains returned. Based on the communication, I suspect this is a Panda update and not a Penguin update, despite just having a Panda update, version 3.9.1 on August 20th, almost 4 weeks ago. So I guess we are due our monthly Panda update but still, we are eagerly awaiting the Penguin refresh. We saw a 50% increase in our Google referrals to a heavily panda'd site yesterday. It has been hit by multiple rounds of Panda and overall has lost 90% of its google traffic since Feb 2011. Has anyone else noticed a bump to a Panda'd site on Sept 14? Yes, us too. One site of ours got nailed on the very first Panda, and yesterday was one,of the best days in a long time, increased traffic and solid conversions. Not sure it is Panda related though. I did my research before 6:30 am, so didn't notice the chatter in my earlier coverage. Mozcast is reporting 88 degrees and turbulence for the day, so they seem to agree. But SERPs.com and SERP Metrics do not share the same findings. Maybe SEOmoz and SERPs.com and SERP Metrics run their tools at different times. Did your site that was hit by Panda see any changes? Are you for the better or worse? Go check your analytics. I will try to get confirmation from Google.